Firefox for Mobile: first screenshots! No sooner do we break the news of the new Firefox for Mobile coming in just over a week for developers, we get some pretty pics to go with it too. 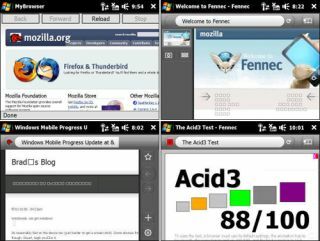 Running using Windows Mobile (presumably) 6.1, the shots show a full-HTML browser with the 'Fennec' logo, which is the codename for the new browser. The Awesome Bar, which lets you search for pages intuitively and directly, is prominent, though can clearly be tidied away for a more screen estate for the web page itself. A simple set of widgets help you navigate through the browser, with favourites, settings etc all present and correct, as you might expect. It also seems Fennec has a weird fox / dog thing as its logo... whatever that's about, let's hope it stays in the alpha version. Check out our original coverage of the FireFox for Mobile alpha release to learn all about the new browser for your handset.